More buzz on "Superfoods". It's early yet, but I think "Superfoods" might be the eating trend of 2006. The U.S. Department of Agriculture recommends these tips to help add whole grains to your daily diet. Substitute a whole-grain product for a refined product, such as whole-wheat bread for white bread, or brown rice instead of white rice. 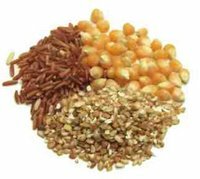 It's important to replace the whole-grain products for the refined one, rather than adding the whole-grain product. Try brown rice or whole-wheat pasta. Stuff brown rice into baked green peppers or tomatoes, and use whole-wheat macaroni in macaroni and cheese. Think mixed dishes: Add barley to vegetable soup or stews, bulgur wheat in casseroles and stir-fries. Create a whole-grain pilaf with a mixture of barley, wild rice, brown rice, broth and spices. You can stir in toasted nuts or chopped dried fruit. Use whole-wheat or oat flour for up to half of the flour in pancake, waffle, muffin or other flour-based recipes. You might need to add a bit more leavening. Try rolled oats or a crushed unsweetened whole-grain cereal as breading for baked chicken, fish, veal cutlets or eggplant parmesan. In stead of croutons in salad, use unsweetened whole-grain ready-to-eat cereal, or substitute it for crackers with soup. Freeze leftover cooked brown rice, bulgur or barley. Heat and serve it later as a quick side dish. Snack on popped popcorn, limiting salt and butter.